One of the great mysteries is why Great Britain has consistently failed to preserve some of the most important military artefacts from its long history of fighting successfully against great odds. An almost equal mystery is why Britain fails to record adequately events and technology from that history. The author is a commissioning editor and author with considerable experience in and enthusiasm for aviation history, especially in WWII bombing. He has written about one of the dual mysteries, the Short Stirling heavy bomber, the first of three battle-winning British heavy bomber aircraft. This book follows the well proven Haynes approach to workshop manuals with many fine illustrations in photographic material and drawings. There is a good history of the Sterling, together with views from pilot, engineer, restorer, and maintainer. The technology is presented in sections, anatomy, and engines. This book is highly recommended and no aviation enthusiast can afford to be without a copy. DESCRIPTION: One of the great mysteries is why Great Britain has consistently failed to preserve some of the most important military artefacts from its long history of fighting successfully against great odds. An almost equal mystery is why Britain fails to record adequately events and technology from that history. The author is a commissioning editor and author with considerable experience in and enthusiasm for aviation history, especially in WWII bombing. He has written about one of the dual mysteries, the Short Stirling heavy bomber, the first of three battle-winning British heavy bomber aircraft. This book follows the well proven Haynes approach to workshop manuals with many fine illustrations in photographic material and drawings. 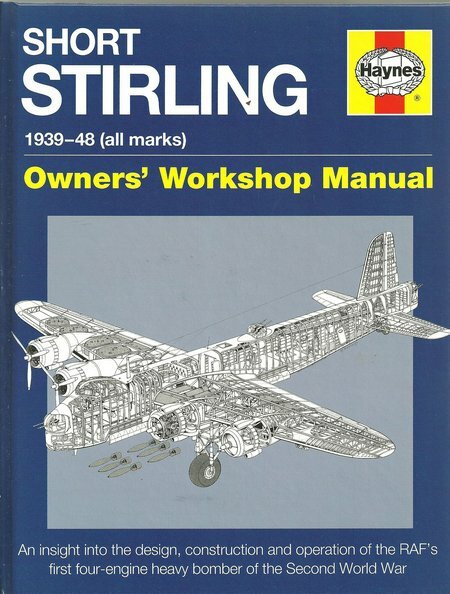 There is a good history of the Sterling, together with views from pilot, engineer, restorer, and maintainer. The technology is presented in sections, anatomy, and engines. This book is highly recommended and no aviation enthusiast can afford to be without a copy. The mystery of British failure to preserve its outstanding military and military engineering history may never be answered. The nearest we get is to understand that the British have long been a tolerant people who queue in an orderly manner and may take pride in some of their military achievements, but have a tendency to wish to move forward into peace. The reasons why some important artefacts are not preserved is variable. At the end of wars, Britain has been quick, perhaps too quick, to turn swords into plough shears and some artefacts are brought back to life through the dedication of individuals and small groups of enthusiasts. In the case of the Short Sterling, no complete aircraft has survived. There are some fragments and a number of enthusiasts have been working towards recreating a complete aircraft by collecting surviving fragments and linking them with reconstructed facsimiles. There may never result in the restoration of a flying Sterling, although with the huge strides made in rebuilding other classic war birds it cannot be discounted completely. Somewhere, someone may be already planning the construction of a facsimile aircraft that is capable of flight, although this may be a look-alike rather than an exact recreation. The Short Sterling was the first of the three famous RAF heavy bombers to enter service and it suffered two problems, being the first where there was no real experience of taking an aircraft of this size and complexity to war, and also suffering from the amount of completely new and advanced components that conspired to reduce reliability. The Handley Page Halifax followed the Sterling into service and shared the use of radial engines for most Halifaxes built. Like the Sterling, the Halifax almost disappeared but a number of near-complete non-flying aircraft have survived. It was to prove a dependable workhorse, but the real star was almost an accident but became the most famous bomber of all time, happily also continuing to fly with two Lancasters flying in Britain together in 2015 and the possibility of up to six more being returned to flying condition. In service, the Sterling was liked by its crews in spite of its reliability record and the long climb up a rickety ladder into the aircraft. The Sterling was almost an essay in new components. This led to its downfall and rapid relegation to other duties. Britain was fortunate that it still had a diverse aircraft industry that was capable of great innovation and had the ability to provide two or three different aircraft for a particular RAF requirement. The delivery of Hurricane and Spitfire to meet the RAF requirement for a monoplane interceptor was to make victory possible, against theoretically overwhelming German odds, in the Battle of Britain. Had only one aircraft been available that victory would have been unlikely. The Hurricane employed much of the technology of its biplane predecessors but in the form of a fast low-wing monoplane with a heavy rifle calibre machine gun armament. It was more than a match for the German bombers and destroyed them in large numbers. It had the great advantage that its method of construction absorbed battle damage and was relatively easy to repair. The Spitfire was very different in its design and construction. That made it difficult to build and more difficult to repair, but it offered sparking performance, was able to more than compete with the German fighters and was capable of considerable further development, eventually developing into the Supermarine Attacker which was the first generation single-seat jet fighter to serve in the FAA from RN carriers. Where the Hurricane proved faster to initially develop and enter RAF service, the Sterling risked its place in history because it was so advanced. The Halifax proved easier to build, reasonably reliable and equipped with radial engines that allowed the in-demand Merlin engines to go to the superlative Lancaster that had developed from the less than inspiring two engine Manchester bomber. Had the Halifax and Lancaster not become available, the Sterling might have received more attention to improve reliability and result in larger numbers being built. As it was, the Sterling was limited to 2,371 aircraft and reach a peak of 12 squadrons by 1943. It was then overtaken by the Halifax and even more dramatically by the Lancaster. That left a large number of aircraft that were still technically advanced and with a good performance. As a result, the Sterling was modified and used for Special Duties, flying arms and agents into Occupied Territory, serving as an assault glider tug, dropping paratroops and continuing on in RAF service until July 1946. The Stirling made great use of hydraulic and electric control systems and this was a large part of the reliability issue. However, the design was based on modular construction and the engines were power eggs that used only four bolts for attachment. Apart from the distance of the nose from the ground, requiring gantries and platforms for engineering access, the Sterling was generally easy to work on. Engines could be detached as complete assemblies for servicing and many other components were equally easy to remove for maintenance. As Britain raced to move from war to peace, the Sterling was one of many items of equipment that was rushed to the scrap yard with considerable efficiency. The author has concluded the story with an account of the work of enthusiasts to collect surviving fragments to restore and build into a more significant restoration. The project is aiming to reconstruct a forward section of fuselage. This may take some time, but there is a realistic prospect of achieving the goal. There have also been a number of other attempts to recreate a complete Stirling, possibly to flying condition. There are however significant challenges to returning a Sterling to the air, not least in achieving minimum reliability standards that would be accepted by an Aviation Authority. One possibility considered by a group of wealthy Americans is to produce a completely new aircraft that is externally a good reconstruction of a Sterling, but one that may be a scaled down version and fitted with modern internal equipment.